Leeks are root vegetables that have layers of overlapping leaves similar to a green onion; however, their onion-like taste is much milder in flavor. 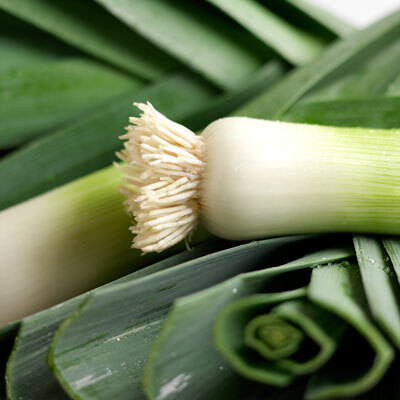 Leeks should be cut in half lengthwise to rinse thoroughly before use. Leeks are commonly used in soups; however, they can be used in any recipe calling for onions - whether cooked or raw. When eaten raw, leeks lend a crunchy flavor and work well in salads or with vegetable dips. Leeks are a great addition to salads, soups and a variety of main dishes. Look for deep green leaves and a firm body. Store leeks in the crisper section of the refrigerator. Rinse thoroughly under cold running water, or slice and place in a bowl of cold water, swishing them around until all dirt is removed. Always wash fresh produce before consuming.